HERE’S A FISH STORY. 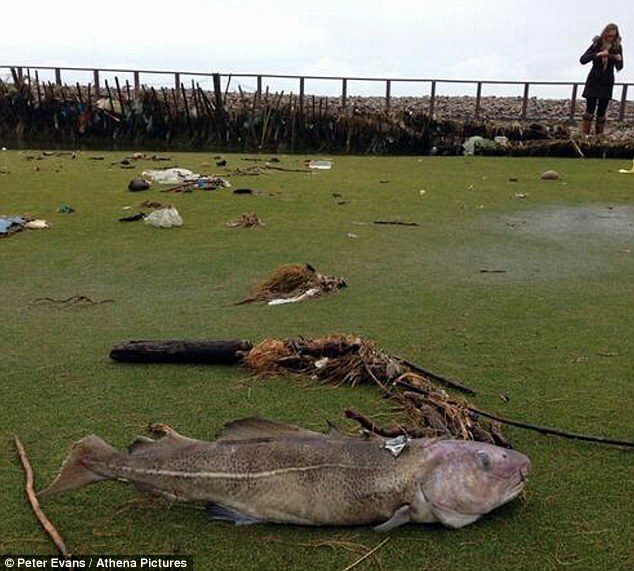 THE HEADLINE: “GIANT 12 LB FISH WASHED UP ONTO SEASIDE GOLF COURSE BY MASSIVE WAVES.” THIS IN WALES. A MAGICAL PLACE, PORTHCAWL. THE MAIL HAD THE STORY. A BIG COD. THEY DIDN’T WEIGH IT BUT IT LOOKED LIKE ABOUT 12 POUNDS. ROYAL PORTHCAWL, A WONDERFUL, HISTORIC COURSE. AS IT HAPPENS THE MEN’S ENTRANCE IS ON ONE SIDE OF THE CLUB, THE FRONT. THE WOMEN’S ENTRANCE IS AROUND THE BACK, AND THE COMMON AREA IS IN THE MIDDLE. I ACTUALLY HAD LUNCH WITH A GROUP OF MEN IN THE LADIES LOUNGE, FOR SOME REASON. THE GIANT COD APPEARED ON THE THIRD GREEN. SAID PRO PETER EVANS: “The tide came over onto the fairway of the third hole. We went to clear up and saw this huge fish lying there. It was a decent size – we didn’t weigh it, but it looked over 12lbs. I’ve been the golf pro here for 20 years and never seen anything like it.’ THEY HELD A WALKER CUP AT PORTHCAWL, ONE OF MY FAVORITE COURSES. AS THE U.S. RYDER CUP TEAM AT CELTIC MANOR LEARNED, WELSH WEATHER IS NOT TO BE TRIFLED WITH. …DID YOU SEE THE COMMENT EARLIER IN THE WEEK FROM PHIL MICKELSON? I’M SURE 26 MILLION AMERICAN GOLFERS CAN EASILY RECALL THE LAST ROUND THEY HAD WITHOUT A BIRDIE WITHOUT MUCH DIFFICULTY. THIS WEEK WE ALSO LEARN THAT 2013 MARKED THE EIGHTH STRAIGHT YEAR THAT MORE COURSES CLOSED IN THE U.S. THAN OPENED. ACCORDING TO THE NATIONAL GOLF FOUNDATION THAT DOES THE MATH, 66 PERCENT OF THE CLOSINGS WERE COURSES WITH GREEN FEES BELOW $40. …ON THAT HAPPY NOTE, GOOD MORNING. THE ENDEAVOR IS TO ENHANCE OUR UNDERSTANDING AND APPRECIATION OF GOLF…. HERE’S SOME OF THE TOPICS WE WON’T BE DISCUSSING THIS HOUR: DENNIS RODMAN, BENGHAZI, PAINFUL ITCHING AND SCRATCHING, AND FOURTH-QUARTER HOUSING STARTS. OUR INSPIRATIONAL TEXT COMES FROM THE BOOK, “CONSCIOUS GOLF,” THE THREE SECRETS OF SUCCESS IN BUSINESS, LIFE AND GOLF. THE AUTHOR, DR. GAY HENDRICKS, HAS A PH D IN COUNSELING PSYCHOLOGY FROM STANFORD, AND HAS WRITTEN MORE THAN 30 BOOKS, INCLUDING TWO WE’LL TALK ABOUT WITH HIM NEXT SEGMENT. NEVER TOO SOON IN THIS NEW YEAR TO DELVE BETWEEN THE EARS. A SUCCESSFUL FOUL SHOT. AFTER TWENTY MINUTES, WE HAD EACH GIRL IN THE CLASS TO THE FOUL LINE AND SHOOT TEN SHOTS IN A ROW. THE BREATH-VISUALIZATION GROUP GREATLY OUTPERFORMED THE GROUP THAT HAD BEEN ACTUALLY SHOOTING BASKETS. THE GIRLS ON THE COURT WERE AMAZED, AS WAS THEIR PHYSICAL EDUCATION TEACHER, BUT IT WAS THE EXPERIMENTERS WHO WERE REALLY THRILLED. THIS LITTLE EXPERIMENT LET ME KNOW THAT MIND/BODY SKILLS LIKE CONSCIOUS BREATHING AND MENTAL IMAGERY COULD BE OF BENEFIT TO PEOPLE WITH MINIMAL ATHLETIC SKILL. AND THANK GOODNESS, BECAUSE ALTHOUGH I AM ENTHUSIASTIC, I AM DEFINITELY IN THE UNNATURAL RATHER THAN NATURAL ATHLETE CATEGORY. AS MY GOLF TEACHER SAID UPON OBSERVING ME FOR THE FIRST TIME: I DON’T KNOW IF THERE’S SUCH A THING AS A NATURAL GOLF SWING, BUT IF THERE IS, YOU DEFINITELY HAVEN’T GOT IT. SO PLEASE DO NOT THINK YOU NEED TO BE A WORLD-CLASS ATHLETE TO BENEFIT FROM CONSCIOUS BREATHING. …DR. HENDRICKS FROM “CONSCIOUS BREATHING.” WE’LL TALK ABOUT IT NEXT SEGMENT. PLEASE DON’T HOLD YOUR BREATH UNTIL THEN – CONSCIOUSLY OR UNCONSCIOUSLY.